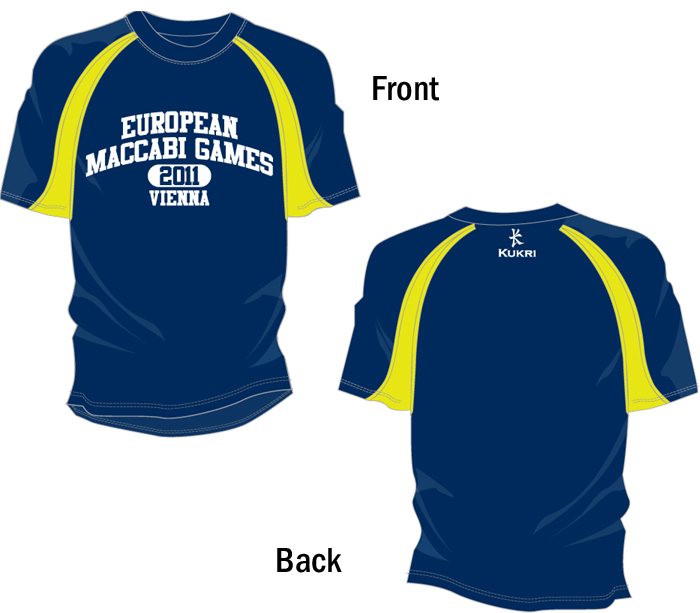 A sporty unisex design, contrasting color detail on the sleeves and the words European Maccabi Games 2011 Vienna make this the perfect EMG 2011 memento. EUR 19.9. For the first time since World War Two, European Jewry will gather together on former Nazi occupied territory to celebrate national and cultural pride in their sporting achievements. This summer, from the 5th to the 13th of July 2011, over two thousand Israeli and Jewish participants from all over the globe with unite in Vienna, Austria for the European Maccabi Games 2011, a sporting extravaganza and celebration of Jewish achievement. This will be the 13th European Maccabi Games, organised by the World Maccabi Union, who also coordinate the Maccabiah Games, held in Israel every four years. The European Games, with participants from over thirty five countries, including Israel, Austria, Great Britain and the USA as well as many European countries will bring the Maccabiah spirit to Vienna. You can be part of the celebrations when you buy this short sleeved unisex stretch t-shirt with the words European Maccabi Games 2011 Vienna emblazoned on its front. This stretch fit t-shirt has piping and contrasting color detail on the sleeves, making it a stylish and athletic choice for sport or just relaxing. This gold standard unisex t-shirt comes in a wide range of sizes and is available in navy blue and bright yellow, helping you to stand out on the track or in the bleachers. Lightweight and easy to fold away, this EMG unisex short sleeved t-shirt, made from 100% polyester, is an ideal gift for friends and family.